You may know Kevin O'Leary as a venture capitalist on the television show Shark Tank. On the show he comes off as being an aggressive and blunt person focused on making money in any way that is legally possible. Based on the show, you may think that O'Leary's investment strategy is focused on early stage high-risk companies that have the potential of a big pay off. He has surely amassed quite a fortune (estimated at about $300 million according to some sources) but it is interesting to find out if he does invest all of his wealth using this high-risk, high-reward approach. I had the pleasure of attending a live talk by Kevin O'Leary where he discussed his views on investing and how to make money in this volatile financial environment. He shared some insight into his personal finances including his high level asset allocation and was surprised to learn that his personal investment style is actually quite conservative. I was expecting to hear that he was heavily invested in growth-oriented companies and early stage high-risk companies. The first principal of investing that he shared was about capital preservation. This is aligned with Warren Buffett's two main rules of investing, which are 1) to never lose money and 2) Never forget rule number 1. The reasons behind these rules are clear to seasoned investors. If a stock drops by 50%, it does not recover if it then rises 50%. It actually takes a 100% gain in order to get back to the breakeven level. For a risk-loving venture capitalist though, there is an understanding that the majority of the new ventures will fail, but when one is successful, it will be big and will more than make up for the other failures. O'Leary runs O'Leary Funds, which is a Canadian mutual fund company that provides clients with diverse investment opportunities that generate reliable monthly income. Its motto is "Get paid while you wait," which is a way of describing how the funds generate monthly income while at the same time being invested in solid stocks to allow for eventual capital appreciation. Investors get the immediate benefits that the funds generate regular dividends, which is the "get paid" portion of the motto. The "while you wait" portion represents the stock holdings of the funds. Investors want to know that the value of the companies that are held will increase over time while they wait so that when retirement comes and there is a need for the money, there will be a nice capital gain as well as the income they received throughout the years. In his talk, O'Leary described a major shift in investor sentiment. Prior to the 2008 financial meltdown, the majority of requests and questions from potential investors were about how to find growth stocks. After the meltdown, the tide has turned and now personal investors want to preserve their wealth. They are not concerned with growth, but they just want to maintain the value of their investments even in the event of another stock market crash. In terms of O'Leary's own asset allocation, even though he is age 58, he actually has about 68% of his wealth in bonds. Of these bonds, he does not own government bonds at all. The yields are too low and he prefers higher-yield corporate bonds. 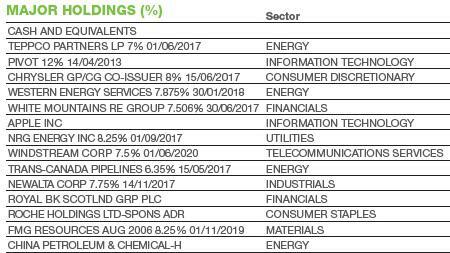 Here is a view of the top holdings of the O'Leary Global Yield Opportunities Fund to give you an example of the bonds he invests in. His theory with this approach is that the bonds decrease the volatility of your portfolio. If the stock market drops 3%, the value of the bonds may drop 0.8%. During a big drop, this means that your net worth will be more stable while still producing income. If there is a 50-50 split of corporate bonds and dividend stocks, you will already be several percent up on the year before capital appreciation is even added to the equation. Regarding his rule about only investing in dividend stocks, he explains that strong companies will always give a share of the profits back to the shareholders. Companies like Research in Motion (RIMM) have grown from nothing, hit a high of over $140 per share and then have fallen back to $8 per share, all without returning a penny to shareholders through dividends. Companies that produce dividends on the other hand, have to ensure that their cash flow is strong enough on a regular basis to make the dividend payout and thus are managed differently. They know that shareholders will continue to demand a steady or growing dividend or else the stock price will fall. Some interesting statistics that he gave on venture capital investing described the success rate in various periods. Prior to the year 2000 when there was a technology boom, about 1 in 10 venture deals made money. After the year 2000, the success rate of venture deals fell to about 1 in 25. In the Shark Tank, the success rate is about 1 in 17 deals that make money. Maybe it is these low odds of success that have caused Mr. O'Leary to be more conservative in the other portions of his portfolio. Overall it was an entertaining and enlightening view of this Shark's personal views on investing. Kevin O'Leary is an entertaining guy who has a disciplined approach to allocating his money. If we all followed his ideas with that same level of willpower and self control, we would probably be better investors.